Robert O'Brien of O'Brien Guitars demonstrates how to fill the gaps at the end of guitar grets using Hot Stuff Original CA glue and pipettes. This is a very important step prior to finishing because a gap in the surface will be a gap in the finish. Robert uses a technique that is very practical in other woodworking applications as well; he uses sands the surface of the surrounding wood to create dust to fill in the gap. Then he uses Hot Stuff to wick inside and harden the dust, leaving a surface which looks just like its surroundings after a little sanding. 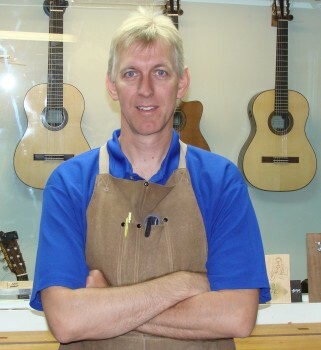 Robert O'Brien of O'Brien Guitars is a master luthier who not only builds custom guitars but also teaches lutherie classes in his shop and at the Colorado School of Lutherie in Denver as well as online classes. In addition, he created several instructional DVDs and regularly releases new videos on the O'Brien Guitars Youtube Channel. Read more about Robert "Robbie" O'Brien in the Bio section of the O'Brien guitars website.